Thursday, September 5 - Sunday, September 8. 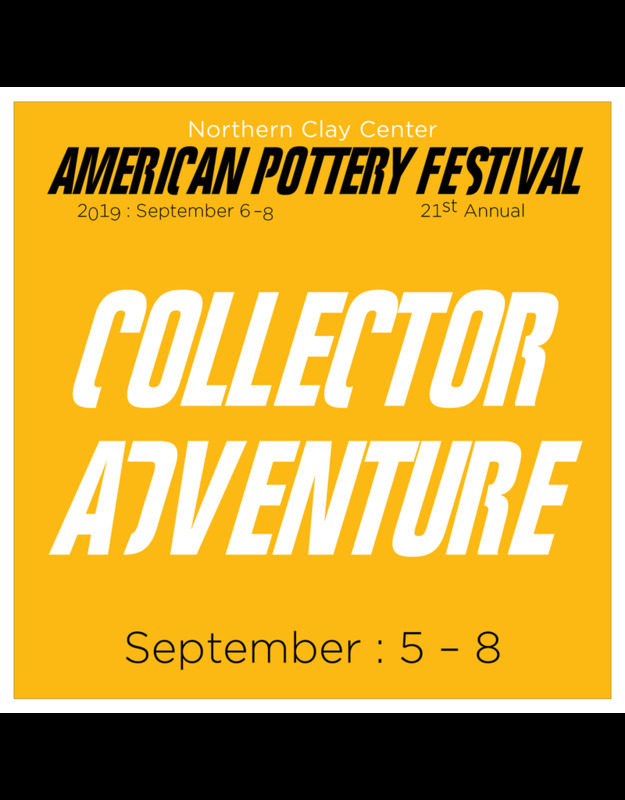 The 2019 Collector Adventure features exceptional opportunities in the ceramic community designed to elevate and educate collectors of every level of interest and dedication. Participation in the Collector Adventure grants you access to an enchanting schedule of events: private collections, exclusive tours, artist studios, demonstrations, and social engagements. The Collector Adventure Includes: Social Engagements • Collector’s Cocktail Party and Artist Reception • Opening Night Benefit Sale, Members Only Preview Hour, and NCC Party of the Year • Saturday Happy Hour with artists and the NCC crew of volunteers and staff Weekend Artist Demonstrations and Lectures, including: • Focal Point with Pattie Chalmers and Dan Anderson • More is More with Joanna Powell and Mike Cinelli • An Unexpected Pairing with Linda Christianson and Brad Schwieger Friday Tour of Private Collections, Studios, and Exhibitions in the Twin Cities NCC will deliver an engaging and informative tour for collectors in 2019. Our region is rich in handmade objects with an abundance of eclectic individuals willing to share their well-versed stories. As always, every collection is recruited because it includes ceramic art, but clay may or may not be the focal point of any given collection. Whether you are interested in collecting for yourself or desire an exclusive look at private home collections, the APF: Collector Adventure will surpass your expectations! Pricing: $250 includes all APF ticket fees, transportation to and from your hotel and NCC during the weekend, as well as a driver and guide to each tour venue. Lunches are provided while touring offsite, and NCC graciously caters all other meals during the festival. Our Collector Adventure guests will travel together by tour van, driven by an NCC representative, and attentively accompanied by a tour leader. Airport transportation and lodging are not included. However, you may direct any inquiries regarding travel and accommodations to tippymaurant@northernclaycenter.org or 612.339.8007 x304.